Don’t you love it when you find a traditional recipe that fits into your lifestyle just as it is? This is not a fake, low-carb version of anything, but a tried and true, classic recipe from India. Read below to find out about the special ingredient in these crispy, crunchy fritters and why they are an exception to the standard rules of keotogenic dieting. I used the old method for making these the first time I tried them. It required rubbing the flour and oil together repeatedly between your palms, beating in the water, and then beating the batter for an additional 10 minutes. Making them in a food processor is so fast and easy; I will never do it any other way! ¾ cup besan flour (black gram dal flour) See Notes below. Remove the stem from the cauliflower and separate into flowerets. Cut large ones into 1-inch pieces. Wash under cold water and drain on paper towels. Reserve. Put besan flour, oil, spices, and salt into the bowl of an electric food processor. Turn on machine and pulse until flour is evenly coated and no lumps remain. Slowly pour in water with machine running and process until it makes a smooth, pourable batter, similar to crepe batter. Scrape batter into a large bowl, cover and put in a warm place (about 80°F) and let stand for at least 30 minutes. An oven with the heat off and the light on should be about the right temperature. 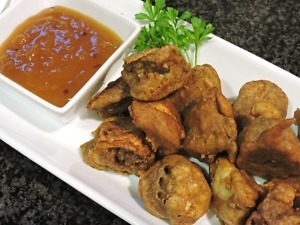 The standing time allows the batter to ferment and makes the fritters lighter. Heat the oil in the fryer to 375° F.
Stir the cauliflower into the batter until coated. Dip out one piece at a time and drop into hot fat. Fry in batches so you don’t crowd the pan. The temperature will drop after the first fritters are added. Regulate the heat to keep it at about 300° while cooking. Stir and turn the fritters until they are lightly golden brown, and very crisp, about 10 minutes. Remove fritters with a slotted spoon and drain in a colander or on a sheet pan lined with paper towels. Repeat with remaining batter. Place in a warm oven until all are ready. Serve hot with a dipping sauce (see below). The fritters can be made a few hours ahead and reheated in a 375°F oven for about 5 minutes or redipped briefly in hot oil. 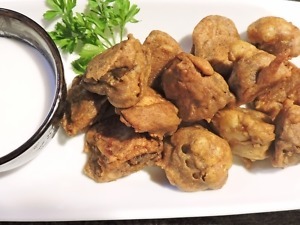 *I made the fritters in the photos with cauliflower and quartered mushrooms, but you may also use cubes of eggplant or paneer cheese. Another popular version is made by mixing chopped onions, chilies, and spices into the gram batter and dropping it from a small spoon into the hot oil. See Notes to read about carbs counts for chana dal. **The cooking fat is not included in the counts as most of it is drained or blotted away. Recipe adapted from one by Julie Sahni in Classic Indian Cooking, 1980. Disclaimer: I am not affiliated with any company mentioned above and have not received free products. 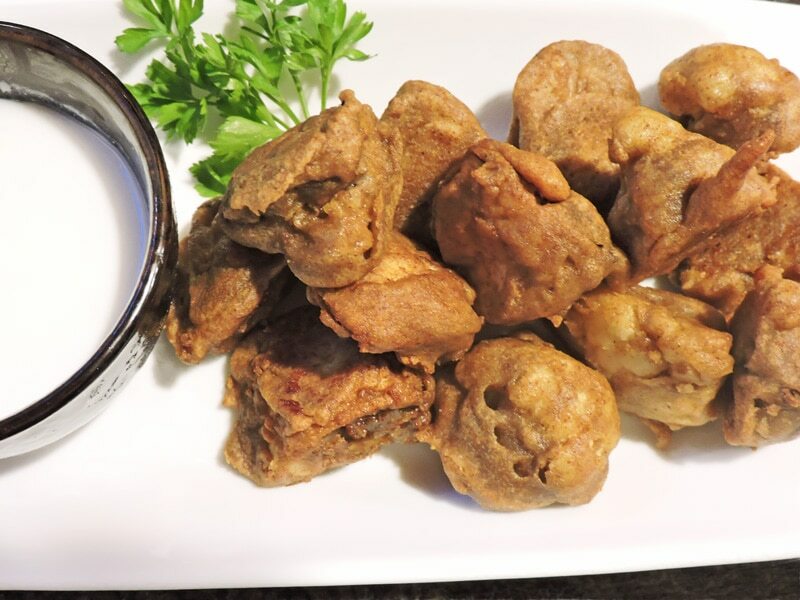 Baby garbanzo bean flour, Fritters, Indian snack or appetizer, Vegetarian option, Very low glycemic. Bookmark. I got the Kala Chana dal at the Indian market in whole form. Do you think I could grind it up and make the flour? It’s the only kind they had. I can’t wait to make this! Laura, Yes, you can soak and sprout it too, which lowers the levels of toxins found in legumes. Then you will need to drain it well and dry it so it doesn’t mold. A dehydrator or an oven with the light left on can dry it. You can grind it in a super-blender like a Vitamix, if you have one or use a grain mill. I have bought sprouted garbanzo flour (from Thrive, I think). It is not really chana dal, but still better than regular garbanzo flour. Good luck, let me know how it turns out. There are so many things you can do with chana dal!